A surge back higher for the major US equity averages on Thursday, with the S&P 500 and Nasdaq 100 hitting new 2019 peaks and five-month highs. This price action has rejected the more negative tone from Wednesday after the Fed indicated a far more dovish tone than anticipated. The main drive to the upside has been a very strong tech sector, led by Apple and Microsoft. 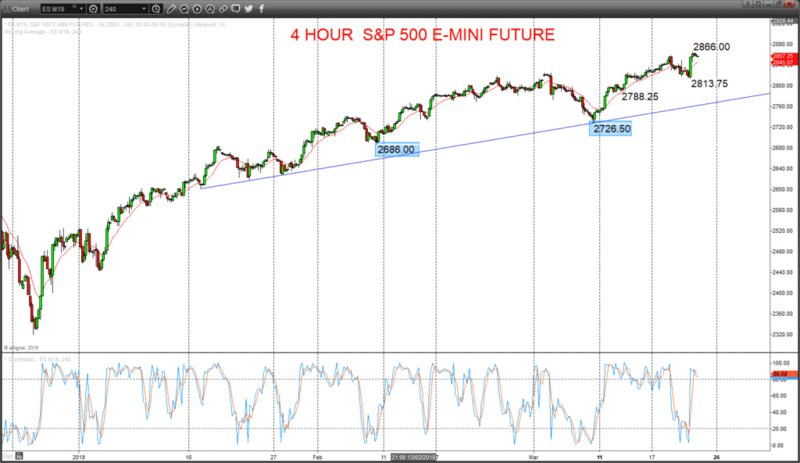 Here we focus on the broad benchmark average future, the S&P 500 E-mini. A surge back higher Thursday through the recent cycle and 2019 high at 2858.75 up to 2866.0, to completely dismiss Wednesday’s rebound failure after the Fed decision, back from 2849.25, to flip risks back to the upside for Friday. We see an upside bias for 2866.0; break here aims for 2874/75, maybe towards 2891.25. But below 2843.5 opens risk down to 2831.25.